CXCR4 and its ligand stromal cell-derived factor 1α (SDF-1α) have recently been implicated in the development of airway inflammation in a mouse model of allergic airway disease. Here we report, for the first time, the expression of a functional CXCR4 in primary human normal bronchial epithelial cells and the regulation of CXCR4 gene expression by proinflammatory mediators. Both bradykinin (BK) and IL-1β induced an accumulation of CXCR4 mRNA in normal bronchial epithelial cells in a time-dependent manner, with peak levels of CXCR4 mRNA reached between 4 and 24 h after stimulation. Ligand activation of CXCR4 in airway epithelial cells resulted in the activation of the extracellular signal-regulated kinase and stress-activated protein kinase/c-Jun amino-terminal kinase signaling pathways and calcium mobilization. 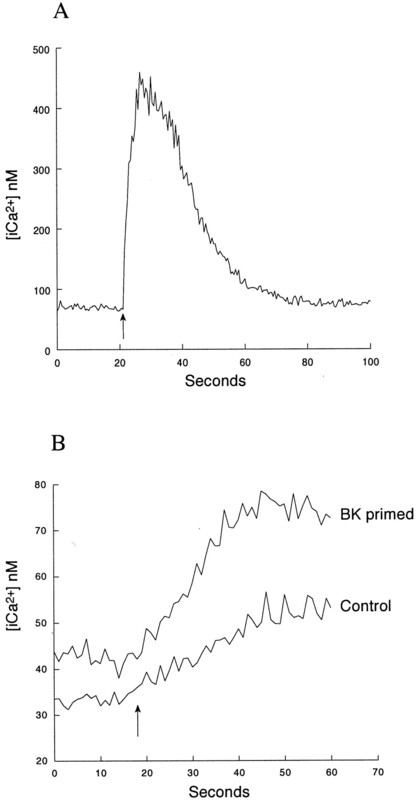 Pretreatment of airway epithelial cells with BK or IL-1β enhanced SDF-1α induced phospho-extracellular signal-regulated kinase and calcium mobilization, in addition to increasing the level of CXCR4 protein. Finally, we describe the expression of CXCR4 mRNA and its regulation by BK in vivo in human nasal tissue. CXCR4 mRNA levels are significantly higher in the nasal tissue of symptomatic allergic rhinitis subjects compared with normal subjects. 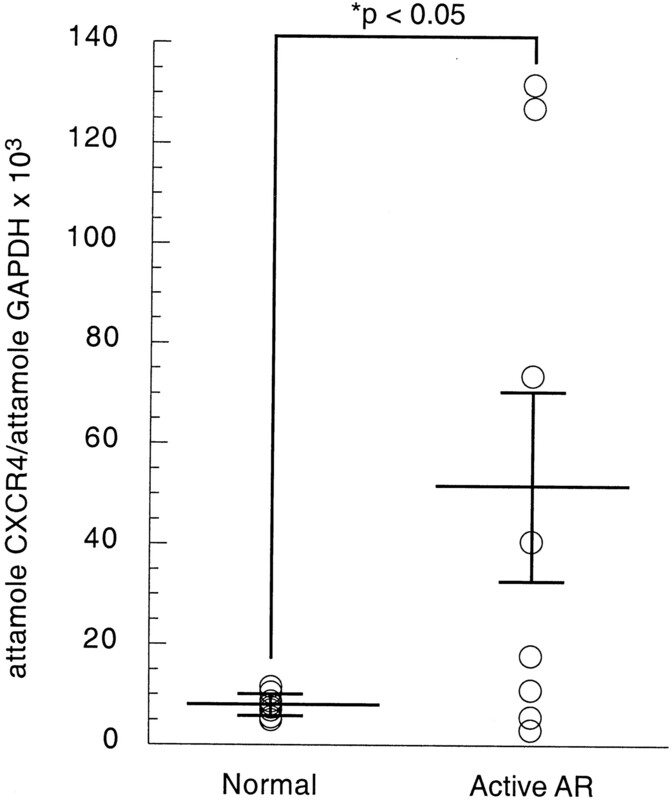 Moreover, BK challenge significantly increased CXCR4 mRNA levels in nasal tissue of mild allergic rhinitis subjects in vivo, but not normal controls. In conclusion, this study demonstrates that human airway epithelial cells respond to proinflammatory mediators by up-regulating the chemokine receptor CXCR4, thus enabling the cells to respond more effectively to constitutively expressed SDF-1α. This may lead to enhanced activation of intracellular signaling pathways resulting in the release of mediators involved in inflammatory allergic airway disease. The chemokine family is composed of structurally related, secreted cytokines that play major roles in the pathogenesis of inflammatory diseases, in part through the regulation of leukocyte trafficking (1, 2, 3, 4). There are two major chemokine subfamilies, CC and CXC, and two minor subfamilies, CX3C and C, each named after the arrangement of their N-terminal cysteines. Approximately 40 chemokines have been identified in the human genome. The biological effects of these small cytokines are mediated by seven-transmembrane domain G protein-coupled receptors. Five CXC receptors and 10 CC receptors have been identified in the human genome. The majority of the chemokines and their receptors exhibit redundancy, with each chemokine having specificity for more than one receptor and each receptor being activated by a range of chemokines. Unlike the majority of chemokines and chemokine receptors, CXCR4 and stromal cell-derived factor 1α (SDF-1α)5 (CXCL12) do not exhibit redundancy. CXCR4 and SDF-1α are constitutively expressed in a wide range of tissues and are essential for normal development (5). As such their potential involvement in the pathogenesis of inflammatory airway disease had been largely overlooked. The CXCR4/SDF-1α axis has, however, been implicated in various disease processes, including rheumatoid arthritis, B cell chronic lymphocytic leukemia, pancreatic tumor progression and chronic inflammation at the blood-retina barrier (6, 7, 8, 9). Furthermore, CXCR4 and its ligand SDF-1α were recently found to be critical components of the inflammatory processes involved in a murine model of allergic airway disease (10). Neutralizing CXCR4 Abs reduced the hallmarks of allergic airway inflammation: airway eosinophilia and airway hyperresponsiveness. In this murine model of allergic airway disease, the level of SDF-1α within the airways remained constant during the inflammatory response. The regulation of the SDF-1α-CXCR4 interaction was presumably due to an increase in CXCR4 cell surface receptor on cells infiltrating the lungs and on resident lung cells. In an attempt to address the potential role of CXCR4 in the pathogenesis of human airway inflammation, we examined the expression of CXCR4 on a resident lung cell type, the airway epithelial cell. Initially, we quantified the effect of proinflammatory mediators on CXCR4 mRNA levels in human primary airway epithelial cells. Subsequently, the consequences of CXCR4 ligand interaction on intracellular signaling pathways in human airway epithelial cells were evaluated. Finally, we measured the in vivo expression of CXCR4 in human nasal tissue and assessed the effect of bradykinin (BK), an inflammatory mediator known to be elevated during airway inflammation, on CXCR4 mRNA levels in human nasal tissue in vivo. Normal human bronchial epithelial cells (NHBEs), obtained from Clonetics-BioWhittaker (Walkersville, MD) and a transformed human bronchial epithelial cell line, BEAS-2B (CRL-9609; American Type Culture Collection, Manassas, VA), were grown as monolayers in 100% humidity and 5% CO2 at 37°C in serum-free defined growth medium (Clonetics) with medium changes every 2–3 days. NHBEs were used on passages 2 and 3. All treatments were conducted in supplement-free medium (SABM; Clonetics) after 16–24 h in SABM. Cells were treated for 2–24 h with either IL-1β (1 ng/ml; R&D Systems, Minneapolis, MN) or BK (10−8 M; PolyPeptide Laboratories, Wolfenbutel, Germany) in SABM. Nonsmoking adults with mild-quiescent allergic rhinitis (defined as subjects with either minimal or no symptoms of allergic rhinitis, diagnosis based on a consistent history and confirmatory skin tests) and normal controls were recruited to participate. Informed consent was obtained in accordance with the Human Subjects Committee at The Scripps Research Institute (La Jolla, CA). Allergic rhinitis subjects were excluded if they had received previous immunotherapy. All allergy and/or asthma medications were withheld for at least 2 wk before challenge. Baseline nasal samples were obtained from the left nare followed by instillation of 200 μg of BK (reconstituted in sterile water) in a 100-μl spray onto the inferior turbinate of the contralateral nare. A subsequent nasal sample was collected from the challenged nare after 4 h. After a period of at least 2 wk, the subject returned for a repeat challenge. A baseline nasal sample was collected from the left nare and the subject was challenged with BK as previously except that the challenged nasal sample was taken 8 h after BK was instilled. Nasal samples were collected by gentle scraping of the inferior turbinate using a Rhinoprobe curette (Arlington Scientific, Springville, UT). The sample was placed directly into RLT buffer (Qiagen, Valencia, California) and snap frozen. A separate group of subjects were recruited from the Allergy Clinic with active symptoms of allergic rhinitis. Informed consent was obtained in accordance with the Human Subjects Committee at The Scripps Research Institute. Baseline nasal samples were collected as described above. Total RNA was extracted from NHBE samples and nasal scrapes using the RNeasy mini kit (Qiagen). DNA was digested during the RNA isolation procedure using the RNase-Free DNase 1 treatment kit (Qiagen). Five hundred nanograms of NHBE RNA was denatured at 65°C for 5 min, placed on ice, and then reverse transcribed in a total volume of 20 μl using random hexamers, dNTPs, RNase inhibitor, and 1 U of Superscript II reverse transcriptase (Life Technologies, Rockville, MD) for 1 h at 42°C. Two hundred fifty nanograms of nasal RNA was reverse transcribed using the Omniscript RT kit (Qiagen). A 1/20 aliquot of the RT product was used for subsequent PCR. The iCycler iQ (Bio-Rad, Hercules, CA) was used for real-time quantitative PCR. The primers used were as follows: CXCR4 forward primer, 5′-acggacaagtacaggctgcac-3′; CXCR4 reverse primer, 5′-cccagaagggaagcgtga-3′; GAPDH forward primer, 5′-gggaaggtgaaggtcggagt-3′; and GAPDH reverse primer, 5′-tccactttaccagagttaaaagcag-3′. The following dual-labeled probes were obtained from BioSearch Technologies (Novato, CA): GAPDH 5′ FAM-ttggtcgtattgggcgcctggt-3′ TAMRA; CXCR4 5′ FAM-tgtcagtggccgacctcctctttgtc-3′ TAMRA. Standards, from 10 to 0.0001 attomoles of the PCR product cloned into pGEMTeasy (Promega, Madison, WI), were run alongside the samples to generate a standard curve. All samples and standards were analyzed in triplicate. The PCR consisted of 1.5 mM Tris-HCl, 5 mM KCl, 2 mM dNTPs, 200 ng of sense and antisense primers and either 4 pmol of CXCR4 dual-labeled probe or 12 pmol of GAPDH dual-labeled probe, either 3 mM Mg2+ for CXCR4 amplification or 4 mM Mg2+ for GAPDH amplification and 1 U of AmpliTaq gold (Applied Biosystems, Foster City, CA) in a total volume of 50 μl. The reaction conditions were 95°C for 10 min followed by 50 cycles of 30 s at 94°C, 30 s at 60°C, and 30 s at 72°C. The starting amount of cDNA in each sample was calculated using the iCycler iQ software package (Bio-Rad). NHBE or BEAS-2B cells were grown to subconfluence in six-well plates, either untreated or stimulated with IL-1β (1 ng/ml) for 24 h, and were treated with 10 ng/ml SDF-1α (R&D Systems) for 1, 5, 15, 20, and 40 min. The cells were washed twice in ice-cold PBS containing 1 mM Na3VO4. Cells were incubated for 10 min in lysis solution (20 mM Tris (pH 7.5), 120 mM NaCl, 10% glycerol, 1% Triton X-100, 1 mM Na3VO4, and 1 mM PMSF) and then the lysates were centrifuged for 20 min at 12,000 rpm at 4°C. The supernatants were collected and stored at −70°C. Protein concentrations were determined using the Bradford assay kit (Bio-Rad). Twenty-five micrograms of protein was separated by SDS-PAGE on a 12% (for ERK and p38 detection) or a 15% (for SAPK/JNK detection) acrylamide gel and electrophoretically transferred to a nitrocellulose membrane. The membrane was blocked with 5% nonfat milk in 1× TTBS (1× TBS and 0.1% Tween 20) for 1 h by shaking at room temperature. ERK, SAPK/JNK, and p38 phospho-specific Abs were used as directed by the manufacturer (Cell Signaling Technology, Beverly, MA). 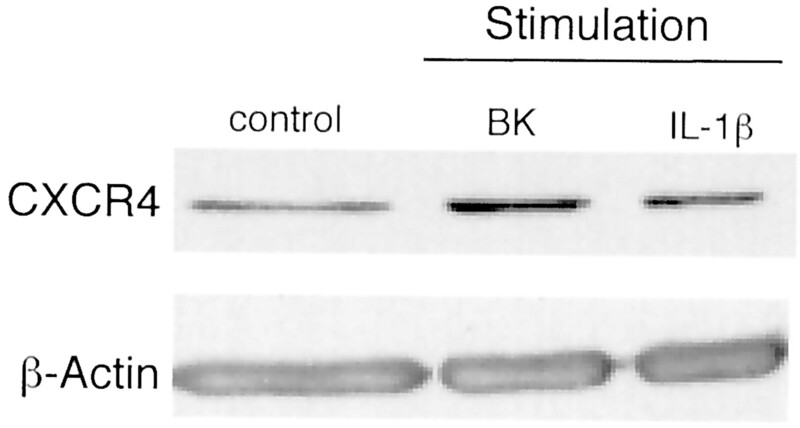 After detection of the phosopho-protein, the blot was stripped and hybridized with Abs specific for total ERK, SAPK/JNK, or p38 as appropriate. BEAS-2B cells were grown to subconfluence in six-well plates and then starved for 16 h with basal medium. Cells were treated for 24 h with BK (10−7 M), IL-1β (10 ng/ml), or medium alone (control). Cells were lysed in 200 μl of lysis buffer and stored at −70°C. Ten microliters of each sample was separated by SDS-PAGE on a 12% acrylamide gel and electrophoretically transferred to a nitrocellulose membrane. The membrane was blocked with 5% nonfat milk in 1× TTBS (1× TBS and 0.1% Tween 20) for 1 h by shaking at room temperature. A CXCR4-specific Ab (ab 2090; Abcam, Cambridge, U.K.) was used as directed by the manufacturer, followed by HRP-conjugated mouse anti-rabbit Ab (Cell Signal Technology). Protein bands were detected by ECL (SuperSignal West Pico Chemiluminescent Substrate; Pierce, Rockford, IL). After detection of CXCR4, the blot was stripped and hybridized with an Ab specific for β-actin (a gift from Dr. E. Chan, Department of Molecular and Experimental Medicine, The Scripps Research Institute, La Jolla, CA) followed by a HRP-conjugated goat anti-mouse Ab (M31507; Caltag Laboratories, Burlingame, CA) and ECL (Pierce). BEAS-2B cells were grown to confluence and incubated with 6 μM fura 2-acetoxymethyl ester (fura 2-AM; Molecular Probes, Eugene, OR) added to the culture medium containing 2.5 mM sulfinopyrazone (Sigma-Aldrich, St. Louis, MO) for 30 min at 37°C. The cells were incubated in medium alone for 30 min before washing twice with PBS. Cells were removed from the culture dish by incubation with 0.05% trypsin/EDTA and gentle tapping. Cells were pelleted and resuspended at a concentration of 0.5 × 106 cells/ml in assay buffer (HBSS, 0.2% BSA, and 2.5 mM sulfinopyrazone containing an equal volume of Accumax (Innovative Cell Technologies, San Diego, CA)). Cells (0.5 × 106) were analyzed for calcium release after stimulation with either SDF-1α (0.02 or 1 μg/ml) or BK (10−8 M). The cells were placed in a stirred cuvette holder at 37°C, and intracellular Ca2+ was monitored by an Aminco-Bowman AB2 spectrofluorometer (SLM Aminco, Rochester, NY) using excitation wavelengths of 340 and 380 nm and an emission wavelength of 510 nm. Software supplied with the spectrofluorometer was used to calculate the intracellular Ca2+ concentration. Statistics were performed using the software program Statview (SAS Institute, Cary, NC). Data were analyzed by the Wilcoxon signed rank test, unpaired t test, or the ANOVA test. The effect of IL-1β and BK on CXCR4 mRNA levels in primary NHBEs was evaluated in a quantitative manner using real-time RT-PCR (Fig. 1⇓). Levels of CXCR4 mRNA were normalized to the housekeeping gene GAPDH and compared with the levels in control samples. Low levels of CXCR4 mRNA were detected in unstimulated NHBEs, before stimulation. Following either IL-1β or BK treatment, increased levels of CXCR4 mRNA were observed at the earliest time point of 2 h. A maximum 4-fold increase of CXCR4 mRNA levels was observed at 8 h after IL-1β stimulation (Fig. 1⇓A). Five sets of NHBEs, each originating from a separate donor, were analyzed. In all five sets IL-1β increased the amount of CXCR4 mRNA with peak levels reached between 8 and 24 h (Fig. 1⇓C). Likewise, BK induced an accumulation of CXCR4 mRNA in NHBEs (Fig. 1⇓B). A peak induction of 5-fold was observed at 4 h after BK stimulation. Again, in all five sets of NHBEs, BK increased the amount of CXCR4 mRNA with peak levels reached between 4 and 24 h (Fig. 1⇓C). IL-1β and BK induced an increase in CXCR4 mRNA levels in a transformed airway epithelial cell line, BEAS-2B (data not shown). IL-1β and BK increase CXCR4 mRNA levels in NHBEs. NHBEs were grown to confluence in six-well plates, cultured for 16 h in basal medium, and treated with either 1 ng/ml IL-1β (A) or 10−8 M BK (B) for 2, 4, 8, and 24 h. Total RNA was harvested and analyzed by real-time quantitative RT-PCR for the expression of CXCR4 and the housekeeping gene GAPDH. Expression was calculated as the mean level of induction compared with control untreated cells. The effects of IL-1β and BK were assessed in NHBEs from five separate donors (C). The data are presented as the maximum level of induction of CXCR4 mRNA observed between 4 and 24 h following either IL-1β (1 ng/ml) or BK (10−8 M) treatment. All results are expressed as mean CXCR4 induction ± SEM of three separate experiments, each assayed in triplicate (∗, p < 0.05, ANOVA test, Fisher’s protected least significant difference). To assess whether human airway epithelial cells express a functional CXCR4, potential downstream effects of CXCR4 ligand interaction were examined. Rapid phosphorylation of ERK was observed in NHBEs after SDF-1α (10 ng/ml) treatment (Fig. 2⇓A). Levels of phospho-ERK peaked at 5 min and then declined to baseline levels by 20 min. 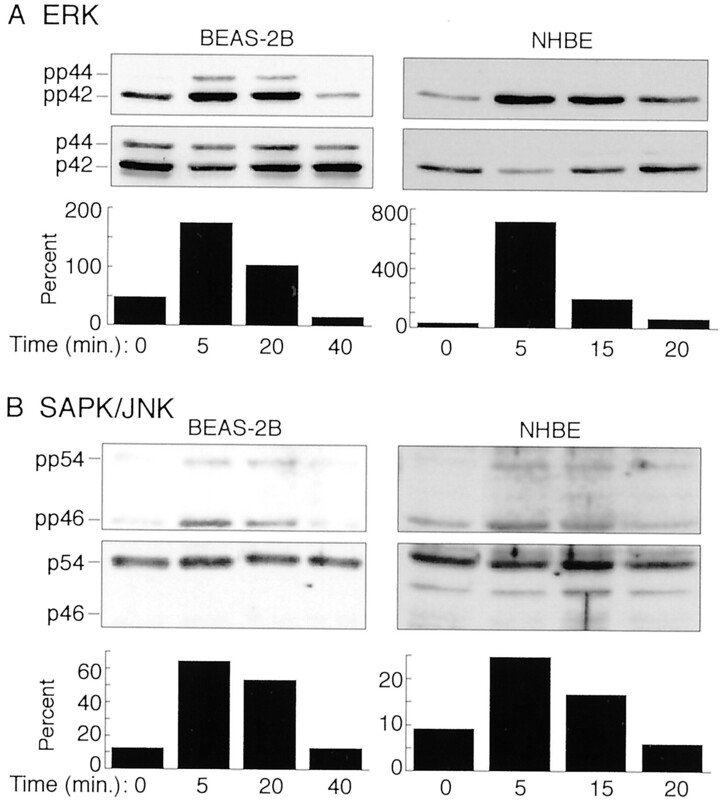 Furthermore, in NHBEs SDF-1α also induced phosphorylation of SAPK/JNK (Fig. 2⇓B). Levels of phospho-SAPK/JNK peaked at 5 min and then declined to baseline levels by 20 min after stimulation. SDF-1α-induced phosphorylation of ERK and SAPK/JNK was observed in NHBEs from different donors and followed similar kinetics. Phosphorylation of p38 was not observed after SDF-1α treatment. SDF-1α produced a similar effect on MAP kinases in the human airway epithelial cell line BEAS-2B. Stimulation of BEAS-2B cells with SDF-1α (10 ng/ml) induced phosphorylation of ERK and SAPK/JNK, but not p38 (Fig. 2⇓). SDF-1α-induced phosphorylation of ERK and SAPK/JNK was observed in BEAS-2B cells at different cell passage numbers, but the time kinetics of the reaction varied slightly between passage numbers, presumably due to changes in the BEAS-2B cell line as it ages. SDF-1α induces ERK and SAPK/JNK phosphorylation in airway epithelial cells. Cells were grown to confluence, cultured overnight in basal medium, and then treated with SDF-1α (10 ng/ml) for the times indicated. The cell lysates were harvested and analyzed by Western blot analysis for total and phospho-ERK (A) or total and phospho-SAPK/JNK (B). After analysis by densitometry, the data were expressed as phosphorylated protein over total protein (plotted as the percent of phospho-MAP kinase). Results are representative of three separate experiments. We next assessed whether IL-1β-induced up-regulation of CXCR4 mRNA also resulted in increased expression of functional cell surface CXCR4 on airway epithelial cells. BEAS-2B cells were treated for 24 h with IL-1β (1 ng/ml) or culture medium alone (control) before SDF-1α (10 ng/ml) stimulation. A pronounced increase in SDF-1α-induced phospho-ERK was detected in IL-1β-pretreated cells compared with medium-alone pretreated cells (Fig. 3⇓A). The difference in phospho-ERK induction was most pronounced at 1 min after SDF-1α stimulation. At this early time point, a 10-fold increase in the level of induction of phospho-ERK by SDF-1α in IL-1β-pretreated cells compared with medium-alone pretreated cells was observed. At 15 min, where maximal phospho-ERK induction was observed, there was still a 5-fold elevation in the level of induced phospho-ERK in IL-1β-pretreated cells compared with medium-alone pretreated cells. By 40 min, the levels of SDF-1α-induced phospho-ERK in medium-alone pretreated cells had returned to baseline levels but remained elevated in the IL-1β-pretreated cells. Pretreatment of airway epithelial cells with IL-1β enhances SDF-1α-induced ERK phosphorylation. BEAS-2B cells (A) and NHBEs (B) were grown to confluence in six-well plates and cultured for 4 h in basal medium before stimulation with or without IL-1β (1 ng/ml) for 24 h. The cells were then stimulated with SDF-1α (10 ng/ml) for the times indicated. Cell lysates were harvested and total and phospho-ERK were detected by Western blot analysis. The stimulation index (phospho-ERK over total ERK) was calculated for each sample by densitometry and is presented graphically. Results are representative of three separate experiments. Likewise, NHBEs were assessed for the effect of SDF-1α-induced phosphorylation of ERK after pretreatment with IL-1β (Fig. 3⇑B). 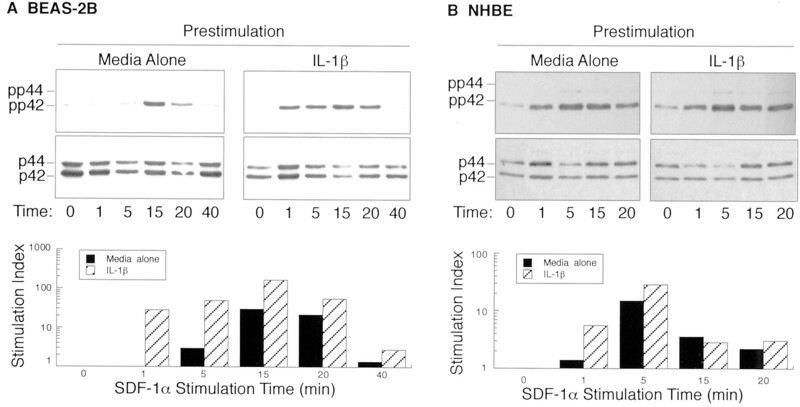 A maximum 4-fold increase in SDF-1α-induced phospho-ERK was observed in IL-1β-pretreated NHBEs compared with medium-alone pretreated NHBEs at 1 min after stimulation. At 5 min, this increase had fallen to a 2-fold difference and by 15 min after stimulation the levels of phospho-ERK in both control and IL-1β were equal. SDF-1α (1 μg/ml) also induced calcium mobilization in BEAS-2B cells, independently demonstrating the cell surface expression of a functional CXCR4 (Fig. 4⇓A). SDF-1α induces calcium flux in BEAS-2Bs. A, BEAS-2B cells were loaded with fura 2-AM as described in Materials and Methods and then stimulated with 1 μg/ml SDF-1α. B, BEAS-2B cells were pretreated with medium alone (Control) or BK (10−7 M) for 16 h before loading with fura 2-AM. The cells were then stimulated with 20 ng/ml SDF-1α. Intracellular fura 2-AM fluorescence was recorded over time. Arrows indicate the points at which the stimulus was added to the cells. Results shown are representative of three experiments. We assessed whether pretreatment with proinflammatory mediators would affect SDF-1α-induced calcium mobilization, in addition to enhancing SDF-1α-induced ERK phosphorylation. At a concentration of 1 μg/ml SDF-1α, no difference in calcium mobilization in BEAS-2B cells pretreated with BK (10−7 M) for either 16 or 24 h compared with untreated cells was detected. However, when a lower concentration of SDF-1α was used for the stimulation, 20 ng/ml, a greater increase in intracellular calcium mobilization was consistently observed in BEAS-2B cells pretreated for 16 h with BK (10−7 M) compared with the amount of intracellular calcium mobilization induced by 20 ng/ml SDF-1α in cells pretreated with medium alone (Fig. 4⇑B). We next assessed whether the observed BK- and IL-1β-induced increases in CXCR4 mRNA and CXCR4 functional responses to SDF-1α in human airway epithelial cells were accompanied by a change in the level of CXCR4 protein. The level of CXCR4 protein was assessed by Western blotting using a CXCR4-specific Ab. CXCR4 protein levels were compared between BEAS-2B cells pretreated for 24 h with either BK (10−7 M) or IL-1β (10 ng/ml) and cells pretreated for 24 h with medium alone. The Western blots were assessed by densitometric analysis and CXCR4 levels were normalized to the level of β-actin. Both BK and IL-1β induced an increase in the amount of total CXCR4 protein (Fig. 5⇓). After BK stimulation, a 4.1-fold increase in the level of CXCR4 protein was detected while IL-1β induced a 2.6-fold increase in the level of CXCR4 protein. Increased expression of CXCR4 protein following BK and IL-1β stimulation. BEAS-2B cells were grown to confluence, cultured in basal medium for 16 h, and then stimulated with BK (10−7 M), IL-1β (10 ng/ml), or medium alone for 24 h. Total cell lysates were collected. The level of CXCR4 protein in the cells was assessed by Western blotting using a CXCR4-specific Ab. Blots were stripped and rehybridized with a control Ab, β-actin, to normalize the data. The blot shown here is representative of three separate experiments. CXCR4 mRNA was detected in nasal tissue from mild-quiescent allergic rhinitis subjects, symptomatic allergic rhinitis subjects, and normal subjects by real-time quantitative PCR. There was no difference in the level of CXCR4 mRNA expression in the nasal tissue of mild-quiescent allergic rhinitis subjects compared with normal subjects. However, the expression of CXCR4 mRNA in nasal samples from allergic rhinitis patients with active symptoms was significantly higher compared with the normal group (p < 0.05, unpaired t test; Fig. 6⇓). In vivo expression of CXCR4 mRNA in human nasal tissue. Total RNA was isolated from nasal tissue from eight normal subjects and eight allergic rhinitis subjects with active symptoms as described in Materials and Methods. The levels of CXCR4 and GAPDH mRNA were then measured by real-time quantitative RT-PCR in triplicate. The ratio of CXCR4:GAPDH mRNA is shown for each subject (∗, p < 0.05). To assess whether exposure to BK could increase airway CXCR4 gene expression in vivo, we measured CXCR4 mRNA levels in nasal tissue samples before and after nasal BK challenge (Fig. 7⇓). CXCR4 mRNA levels were measured by real-time quantitative PCR at baseline as well as at 4 and 8 h after BK challenge in seven mild-quiescent allergic rhinitis and seven normal subjects. In the nasal tissue of mild allergic rhinitis subjects, BK induced a statistically significant increase in CXCR4 mRNA levels (p < 0.05, Wilcoxon signed rank test), whereas no significant effect of BK on CXCR4 mRNA levels in nasal tissue of normal subjects was observed. Simply rinsing the nare with saline in normal or allergic subjects had no effect on CXCR4 mRNA levels (data not shown). As an additional control, CXCR4 mRNA levels were assessed in baseline samples from the left and right nare of both normal and mild allergic subjects. No statistically significant variation in baseline CXCR4 mRNA levels between or within these two subject groups was observed (data not shown). BK regulates in vivo CXCR4 mRNA expression in nasal tissue of allergic rhinitis subjects. Allergic rhinitis subjects were challenged with intranasal BK (200 μg) and nasal tissue obtained 4 or 8 h later. Total RNA was isolated and each sample was analyzed in triplicate for CXCR4 and GAPDH expression by real-time quantitative RT-PCR. The ratio of CXCR4:GAPDH mRNA is shown for each subject at baseline as well as the maximum level of CXCR4:GAPDH mRNA 4 or 8 h after BK challenge. In recent years, the airway epithelium has been recognized to be dynamically involved in the progression and attenuation of inflammatory diseases, with substantial evidence demonstrating that the airway epithelium plays a central role in amplifying the allergic response. Airway epithelial cells are capable of producing a range of cytokines, such as eotaxin and RANTES, thus contributing to the “soup” of inflammatory mediators elevated in the inflamed airway lumen (11). Recently, CXCR4 and SDF-1α have been shown to play a pivotal role in the allergic airway response in a mouse model of allergic airway inflammation; however, the potential role of the CXCR4-SDF-1α interaction within human allergic airway disease has not been previously examined (10). As SDF-1α is constitutively expressed, the level of the receptor, CXCR4, may be important in the regulation of the interaction and signaling of this ligand receptor pair. For example, high levels of CXCR4 on synovial T cells, in addition to the elevated local levels of SDF-1α, are potentially responsible for the recruitment and retention of T cells into the synovial microenvironment during rheumatoid arthritis (6). A functional CXCR4 was recently demonstrated in a transformed type II human airway epithelial cell line (12). In this study, we first sought to determine whether human primary bronchial epithelial cells express a functional CXCR4. We then proceeded to analyze the effect of proinflammatory mediators on CXCR4 expression in human airway cells, both in vitro and in vivo, as well as the cellular consequences of CXCR4 ligand activation within airway epithelial cells. We demonstrate, for the first time that the expression of CXCR4 in NHBEs is regulated by inflammatory mediators known to be elevated within the human airway lumen during inflammation. BK and the cytokine IL-1β each stimulated increased expression of CXCR4 mRNA in both cultured primary and transformed airway epithelial cells. In a typical example, in NHBEs BK induced a 5-fold increase in CXCR4 mRNA levels at 4 h while IL-1β induced a maximum increase of 4-fold in levels of CXCR4 mRNA at 8 h after stimulation. Although BK and IL-1β each induced an increase in CXCR4 mRNA levels in NHBEs from all five separate donors, the level and kinetics of induction of CXCR4 mRNA varied, presumably due to heterogeneity within the human population. The variation in the level of induction of CXCR4 in NHBEs is not surprising and could be due in part to interdonor variability in the level of expression of receptors for BK and IL-1β. In agreement with our findings, IL-1β has been demonstrated to elevate CXCR4 mRNA levels in human pigment epithelial cells (7). Both IL-1β and BK are known to activate the transcription factors NF-κB and AP-1 (13, 14, 15). Binding sites for both NF-κB and AP-1 are present within the promoter region of CXCR4, presenting a possible mechanism by which these inflammatory mediators could regulate CXCR4 gene transcription. We next examined the levels of CXCR4 mRNA in vivo in nasal tissue from normal subjects, mild-quiescent allergic rhinitis subjects, and allergic rhinitis subjects with active symptoms. There was no difference in the levels of CXCR4 mRNA between the normal and mild-quiescent allergic rhinitis subjects. However, CXCR4 mRNA levels were significantly increased in symptomatic allergic rhinitis subjects compared with normal subjects. Furthermore, in vivo nasal challenge with BK significantly increased CXCR4 mRNA levels in mild-quiescent allergic rhinitis subjects. In contrast, we did not observe any significant effect of BK on CXCR4 mRNA levels in nasal tissue of normal subjects. This observation possibly reflects a difference in the response to BK by airway cells in allergic rhinitis subjects compared with nonallergic subjects. This could potentially be due to differences in the levels of B2 BK receptors in allergic compared with normal individuals. This study clearly demonstrates that BK is able to regulate CXCR4 gene expression in human airway tissue in vivo. Although nasal scrapes are composed of a variety of cell types, including epithelial cells, mast cells, basophils, and eosinophils, we have observed that epithelial cells comprise >95% of the cell population in a nasal scrape. In conjunction with the in vitro data demonstrating regulation of CXCR4 gene expression in NHBEs by BK, this evidence strongly suggests that BK regulates CXCR4 mRNA levels in nasal epithelial cells in vivo. To examine the effect of proinflammatory mediators on levels of functional cell surface CXCR4, the consequences of SDF-1α stimulation on ERK phosphorylation and calcium mobilization were assessed in BEAS-2B cells pretreated with either IL-1β or BK compared with medium-alone pretreated cells. In BEAS-2B cells pretreated with IL-1β, SDF-1α induced increased phosphorylation of ERK compared with medium-alone pretreated cells. One minute after SDF-1α stimulation, SDF-1α-induced ERK phosphorylation was 10-fold higher in IL-1β-pretreated cells compared with medium-alone pretreated cells. This observation strongly suggests that IL-1β not only up-regulates the levels of CXCR4 mRNA in airway epithelial cells but also up-regulates the number of functional CXCR4 cell surface receptors. Furthermore, this increase in SDF-1α-induced phosphorylation of ERK was also observed in NHBEs pretreated with IL-1β. The level of SDF-1α-induced phospho-ERK was 4-fold higher in pretreated cells compared with the medium-alone pretreated cells. 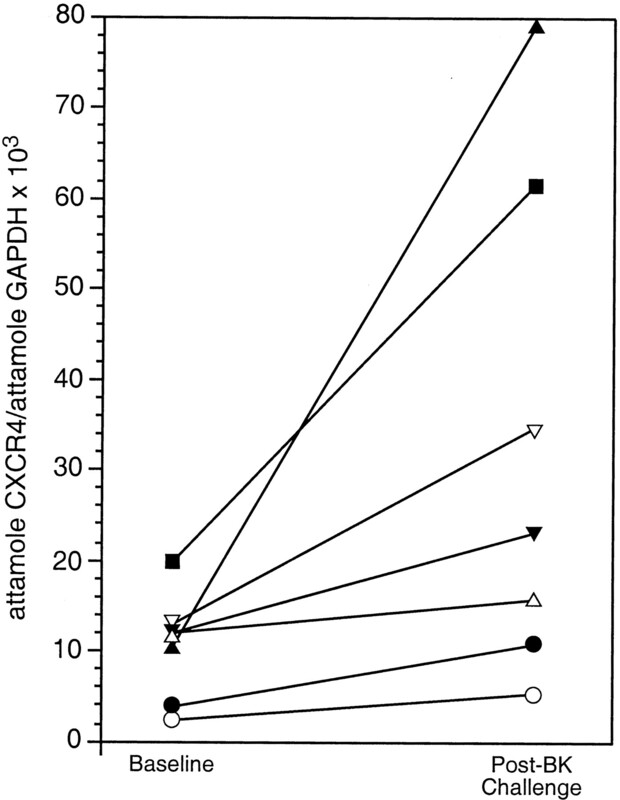 Similarly, SDF-1α-induced calcium mobilization was increased in BEAS-2B cells pretreated with BK compared with medium-alone pretreated cells, thus demonstrating that BK directly affects CXCR4 function, either by increasing the number of CXCR4 cell surface receptors or by increasing the affinity of the CXCR4 receptor for its ligand. In addition to demonstrating an increase in functional CXCR4 receptor, we observed that both BK and IL-1β induced an increase in total CXCR4 protein levels in human airway epithelial cells. Total CXCR4 protein levels were increased 4.1-fold following BK treatment while IL-1β induced a 2.6-fold increase in total CXCR4 protein levels. This strongly suggests that the increased sensitivity of airway epithelial cells to SDF-1α following exposure to proinflammatory mediators is due to an increase in the number of CXCR4 receptors. As SDF-1α is constitutively expressed, increased CXCR4 cell surface expression on airway epithelial cells in situ may lead to increased activation of MAP kinase pathways. The cellular consequences of this could include increased expression of target genes within the epithelial cell. The production of chemokines in response to SDF-1α has been demonstrated in several types of human epithelial cells. SDF-1α induced the production of growth-related oncogene α and IL-8 by intestinal epithelial cells while monocyte chemoattractant protein 1, IL-8, and growth-related oncogene α were released from retinal pigment epithelial cells after SDF-1α stimulation (7, 18). As SDF-1α induces phosphorylation of several MAP kinase in NHBEs, it is highly probably that one of the outcomes of this response is the release of chemokines into the airway lumen. Further studies are required to establish the downstream consequences of CXCR4 ligand activation in human airway epithelial cells. In conclusion, this study presents the novel observations that human primary airway bronchial epithelial cells express a functional CXCR4 cell surface receptor and that CXCR4 expression is regulated by the inflammatory mediators BK and IL-1β. Furthermore, we have demonstrated that BK can regulate CXCR4 gene expression in vivo in human airway tissue of allergic rhinitis subjects. Ligand activation of CXCR4 in NHBEs resulted in the activation of the ERK and SAPK/JNK signaling pathways. The induced increase in CXCR4 mRNA in human airway epithelial cells was accompanied by an increase in functional cell surface receptors, exemplified by an increase in SDF-1α-induced activation of ERK and calcium mobilization. Furthermore, the induced increase in CXCR4 mRNA was associated with an increase in the level of CXCR4 protein, thus accounting for the increased functional responses to SDF-1α following either BK or IL-1β pretreatment of the cells. Within the airway of individuals with active allergic inflammation, the epithelium is exposed to elevated levels of proinflammatory mediators, such as IL-1β and BK (19, 20); therefore, levels of cell surface CXCR4 will presumably be increased. This is consistent with our observation of increased levels of CXCR4 mRNA in nasal samples from subjects with active allergic rhinitis. Thus, enhanced intracellular signaling due to increased CXCR4 cell surface expression on the airway epithelium could result in an increase in gene transcription and subsequent release of inflammatory mediators into the airway lumen, thereby contributing to the amplification of airway inflammation. We acknowledge the invaluable assistance of Kelvin Robinson, our nurse coordinator, as well as the excellent support of the entire General Clinical Research Center staff. ↵1 This work was supported by National Institutes of Health Grants HL61003 and RR00837 and the Sam and Rose Stein Charitable Trust Fund. ↵2 This is manuscript number 14335-MEM from The Scripps Research Institute. ↵4 Current address: Department of Allergy, Southern California Permanente Medical Group, San Diego, CA 92111. ↵5 Abbreviations used in this paper: SDF-1α, stromal cell-derived factor 1α; NHBE, normal human bronchial epithelial cells; ERK, extracellular signal-regulated kinase; SAP, stress-activated protein; SAPK, SAP kinase; JNK, c-Jun amino-terminal kinase; MAP, mitogen-activated kinase; SABM, supplement-free medium; fura 2-AM, fura 2-acetoxymethyl ester.